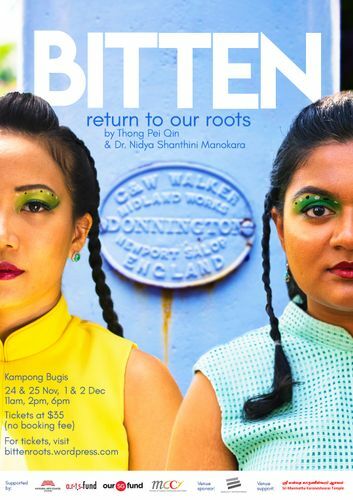 This November, theatre-makers Thong Pei Qin and Dr. Nidya Shanthini Manokara invite you to BITTEN: return to our roots (BITTEN), a site-specific theatrical journey at Kampong Bugis, to uncover memories and histories buried within the old Kallang Gasworks and the community that once thrived around it. BITTEN features previously unknown stories of past residents and workers in Kampong Bugis from diverse origins and cultures - including the creator’s own grandparents who had strong connections with the area. These stories as well as their own shared experiences of dengue fever led the two to create BITTEN. Sharing the same dengue-infected blood, the two friends were curious about the kinds of connections which bind people beyond blood relations and across cultures. Director Thong Pei Qin (When the Cold Wind Blows, Step Outta Line) and Choreographer Dr. Nidya Shanthini Manokara (Wandering Women, Becoming Mother) bring their unique blend of multi-disciplinary theatre to Kampong Bugis through BITTEN. These stories of Kampong Bugis will be told through verbatim theatre and a fusion of bharata natyam and contemporary dance. It will also be performed mainly in English, with a mixture of Tamil and Mandarin. These stories will be brought to life by performers Seong Hui Xuan (Rent, Tropicana The Musical, The Last Bull: A Life In Flamenco) and Masturah Oli (Teen Chorus in Pursuant: The Musical, Step Outta Line). Together with dancers, the versatile ensemble will bring the audience on a journey through Kampong Bugis, fusing multiple theatrical styles to reflect the multitude of stories that span across generations and cultures. Throughout this journey, the audience will encounter sites including the 130-year-old Sri Manmatha Karuneshvarar Temple, the mysterious banyan tree at Kallang Riverside Park and the iconic Kallang Gasworks Holder that is gazetted as a historic site by the National Heritage Board. The journey will begin and end at the former Sam Tat building, an old storage warehouse that is now home to the eclectic Camp Kilo. Here, the audience can enjoy a curated exhibition on the history of Kampong Bugis. Poignant and itch-inducing, BITTEN invites you into a curious world abuzz with rich Singaporean cultures, the supernatural, and multiple truths. It looks closer at what fundamentally roots and bonds all of us, in our generation’s attempts to reconnect with our cultures and lineage, and to form friendships across cultures, at the mercy of dropping blood platelet counts. BITTEN is supported by the Harmony Fund of the Ministry of Culture, Community and Youth (MCCY), the National Arts Council (NAC), Arts Fund, Our SG Fund, Series of Intentions (Venue Sponsor), and the Sri Manmatha Karuneshvarar Temple (Venue Supporter).